Contract Research Organizations (CROs) and Sponsors. The SEND format enables more efficient review of nonclinical data, offering improved data quality, accessibility and predictability. The standard itself has been designed to provide a vehicle for more easily transporting to regulators the results of the majority of standard regulatory toxicology studies. The introduction of SEND for both regulatory submission and the electronic exchange of toxicology data is having a significant impact on the industry and now that the FDA SEND Mandate for providing regulatory submissions in electronic format is in force, organizations must use the appropriate FDA-supported standards, formats and terminologies specified in the FDA Data Standards Catalog for NDA, ANDA, IND and certain BLA submissions. Failure to comply with the Mandate can result in the FDA’s technical rejection or refusal to file a submission, therefore, it is vitally important that organizations are SEND compliant. As of March 15, 2019, new study types, such as Reproductive Toxicology and Safety Pharmacology, have been added under the SEND 3.1 standard for regulatory adoption. In this period of change, Sponsors and CROs are faced with a growing list of choices for becoming SEND-compliant, which can be complicated to assess, have yet to be truly tested in the market and do not truly fit to their stage of SEND-readiness. With a wealth of unparalleled experience in supporting companies to prepare for the standard, Instem provides organizations with clear SEND guidance at any stage of readiness with pragmatic, practical and proven solutions. Instem’s submit suite of tools and outsourced services is now the most widely adopted SEND solution in the market across 15 countries. Submit serves the needs of both producers and consumers of SEND data. But, we have developed submit knowing that many organizations both create and consume SEND data in the course of their operations. The platform also supports the very wide range of demands that span the needs of the largest multi-national pharmaceutical organizations and CROs to the smallest organizations and their advisors. Whether you are simply using SEND to get to a regulatory submission in order to move your R&D program forward or you see it as the vehicle to enable you to leverage your safety data to generate new insights, Instem can provide the support you need. Our data management and analytics products are sophisticated and designed to support regulatory queries as well as data mining. The workflow management aspects of SEND can automate the flow of SEND data into a data repository and/or onwards to your regulatory submissions system as required. The introduction of SEND for the submission of study findings to the FDA presents the industry with opportunities and challenges alike. Instem’s SEND experts help organize, educate and guide clients to becoming SEND-Ready, identifying specific approaches so as to maximize the benefits of SEND while ensuring they comply with regulatory guidance. Across every stage of SEND-Readiness, clients can choose from one or more solution-services that will help them in their journey towards SEND compliance while minimizing the impact within their organization. This includes the option for organizations to completely turn to Instem as their fully-outsourced SEND department. On December 17, 2017, the FDA SEND 3.0 Mandate for providing regulatory submissions in electronic format came into force. All organizations must now use the appropriate FDA-supported standards, formats and terminologies specified in the FDA Data Standards Catalog for NDA, ANDA, IND and certain BLA submissions. Additionally, as of March 15, 2019, new study types, such as Reproductive Toxicology and Safety Pharmacology, have been added to the SEND 3.1 standard for regulatory adoption. Whether you run your own studies, outsource everything or a blend of the two, our efficient and compliant solutions have been designed to streamline your operations and minimize the costs of compliance. The submit™ platform provides configurable components that enable you to create workflows to match the study data sources and processes that support your mission-critical submission processes. Whether you are creating FDA-ready SEND datasets or SEND datasets to meet the specific requirements of a sponsor, Instem’s submit™ platform offers both software and professional services to support the efficient and commercial creation and management of datasets. We understand that the time required to create final study documents is crucial for the success of CROs. Our consultants work with you to make sure, whether you are using our software or our services, that the workflows we implement provide you with excellent value for money as well as ensuring that you are able to meet the expectations that you have set with your customers. For CROs, the submit™ platform provides tools to accept data from any electronic source system and to convert that data into SEND datasets. We can blend together data collected in standard In-Life collection systems with those from specialized analysis systems and data provided by, for example, contract pathologists to generate a single combined dataset. CROs, has one of your sponsors asked if their study can be returned in SEND ahead of you being SEND-Ready™? Touch base with us and we can give you an immediate quote for converting the study. Instem provides customers with a practical introduction to the standards specified by the FDA for electronic submission of nonclinical study data. Clients receive practical knowledge about SEND in a language familiar to staff in the nonclinical community, helping them understand and navigate the standards so they can be applied to their study designs and operating practices. This structured consultancy service is provided to facilitate discussion, analysis and planning for organizations that are preparing to provide standardized Nonclinical eStudy Data as part of regulatory submissions to the FDA in electronic format. It provides sponsors and CROs with an assessment of their current state related to SEND, and a plan for implementation of SEND across their entire organization. 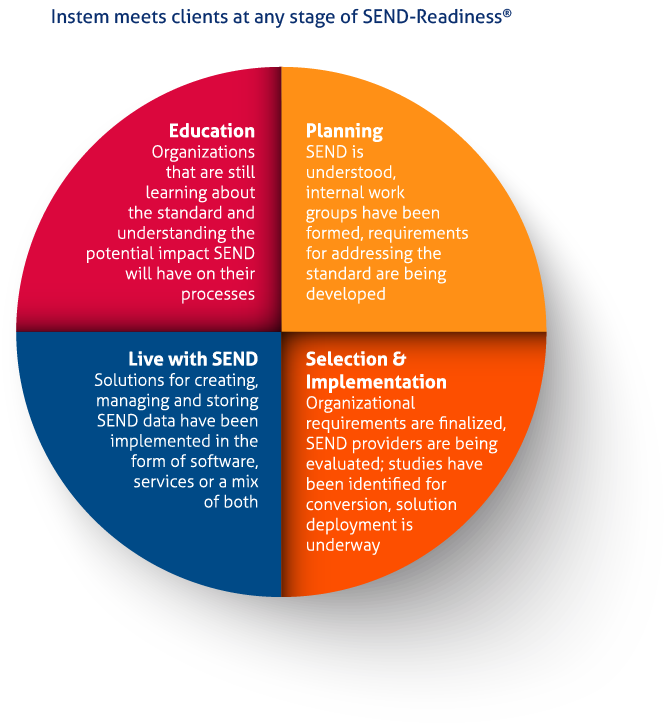 Clients receive a comprehensive and unbiased SEND-Readiness Report describing the recommended steps that the organization should take for a successful SEND implementation. The report describes the key findings and recommends the particular activities that need to be performed in order for the client to integrate SEND optimally into their organization. Instem’s dedicated team of experts can rapidly turn your manual or electronic data into the necessary format, as well as providing the supporting documentation and metadata. Data provided in electronic files, databases, paper and PDF, from one or more sources, can all be accommodated. Instem also help customers to understand how their data has been rendered in SEND, providing a systematic walkthrough of their own dataset and relating it to their traditional forms of study data representation. Some customers use Instem Study Conversion Services as a means of transitioning their organization towards SEND. Others turn to Instem for help with converting legacy studies, some for managing peaks in their own conversion workload or due to internal SEND resource constraints. There are also organizations that simply want to see how their data looks in SEND as part of their preparations for implementing a solution. Instem’s long term involvement with SEND combined with our many years of handling customers’ data makes us a natural partner for SEND study conversion services. Using our conversion services, clients receive timely, accurate and cost effective renderings of their study data in SEND format. Instem’s team of SEND experts perform a comprehensive review of a client’s completed SEND dataset package (datasets, DEFINE.xml, SDRG) to ensure that it complies with all relevant standards and best practices. This review can be performed on a package created by the client, or received by the client from a CRO, regardless of the system that created the dataset. This independent review provides assurance that a client’s study package will correctly and completely represent their collected study data at the time of submission. This custom-tailored service is offered to organizations that may be struggling with a SEND related topic or those that just need some additional guidance at any stage of SEND-Readiness. Backed by the foremost experts on SEND, areas of support can typically include Sponsor-specific responsibilities, support through initial dataset creation, registration support & lifecycle management, CRO management, FDA test submission support and custom training. Organizations have the option of turning to Instem as their own internal SEND experts to execute every aspect of the SEND Management Process. Across each stage of SEND-Readiness, Instem will act as an extension of their organization, providing internal and external stakeholders with dependable processes for creating, managing and storing SEND data, including assistance with submissions, if applicable. Instem offers flexible SEND outsourcing programs allowing clients to tailor a package that best suits them today. Our subject matter expertise in conjunction with the most widely adopted set of SEND tools can translate into a seamless SEND service for clients of every size. - regardless of your state of SEND readiness.